North Pole Hoops founder Tariq Sbiet and I just spent 9 days connecting with the basketball community and learning about the game in Nova Scotia, while taking in Basketball Nova Scotia’s U14, U16 & U18 Provincial championship tournaments. After working in women’s basketball with NPH for a year, Nova Scotia was a new experience for me, being there for the first time. Throughout the week, we were able to connect with special people who are growing the game in the province. 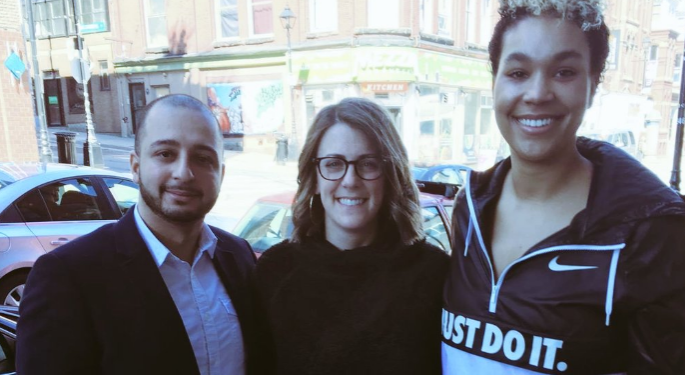 We had the opportunity to meet with great leaders in the community–the Mayor of Halifax, Executive Director of Basketball Nova Scotia, program directors, and coaches. Our goal is to learn about the needs of the game in Nova Scotia; its challenges, common trends, and how we can best contribute to the growth of the province’s players, coaches and ultimately the game. Dialogue and collaboration was the theme of our trip, and it was exciting to see the amount passion and care for the game that exists in NS. We started in Windsor, Nova Scotia, where King’s-Edgehill School Head Coach Marc Ffrench hosted us on their beautiful campus and gave us a tour of the facilities and resources offered to the student-athletes at KES. This prep girls basketball program has the potential to challenge its athletes and elevate the level of competition while providing a top-notch opportunity from home. The Nova Scotia Sports Hall of Fame was another highlight of the week, where we met Shane Mailman and Christina Brien–two leaders in the community that help educate people both inside and outside the province on the rich history that exists. We were able to learn about the history of athletics and the deeply rooted basketball culture in the province. The Hall of Fame is free to the public and offers different educational programs that aim to inspire young Scotians to pursue athletic excellence. This explosion demolished a large part of the city, hockey rinks and other athletic facilities included. But, many basketball gyms were located in church basements, leaving them intact after the explosion. This propelled basketball to become the largest winter sport in Nova Scotia! Katherine Brien is the Executive Director of Basketball Nova Scotia. She has recently taken on this position and has worked tirelessly to understand the basketball community and overcome some of the deep rooted racial and socio-economic differences that are causing division. Nova Scotia as a province and BNS as a governing body are able to utilize the engrained love of basketball as a vehicle to open dialogue and a more inclusive future for its athletes. We believe in Katherine, and want to support her leadership in this process to bridge gaps all over the province. It won’t happen overnight, and it won’t happen alone but the necessary effort is being placed to progress with new leadership and new energy. Mayor Mike Savage welcomed us to City Hall to discuss initiatives in supporting and fueling the future of basketball at home in Halifax, including the NPA’s first ever event (session) coming this fall, hosted by Halifax Prep. The province’s rich history is documented through museums, art galleries, and local attractions across the province—elements that we are working together to showcase to league members travelling from across the country. The upcoming session provides the opportunity for student-athletes to travel as well as learn about the individualities of different provinces, populations and lifestyles in Canada. We worked hard in Halifax but we also had time to play! We roamed the streets of downtown Halifax and enjoyed the unique shops and graffiti art; visited the famous Darrell’s for Annual Burger Week celebrations; hopped in on a local cycle workout class; enjoyed the waterfront and its freezing cold breeze; and of course checked out Salty’s for some seafood. Let’s talk ball! I was impressed with the players’ ability to read the game and play without any offensive sets; I saw a lot of scoring off of backdoor cuts, quality transition, and penetrate and kick. Although height was lacking on every roster, Nova Scotia has some quality lengthy guards with good instincts and toughness. The Community Y Panthers lost in the Bronze medal game, but crafty and aggressive guard play, along with the team’s athleticism presented a challenge for opponents all season. The Bedford Eagles were successful playing in the open court scoring in transition and got quality looks off of ball movement and back cuts. Congratulations Coaches Steve Mullane & Carole Moore and the entire Bedford Eagles squad! The ABA Celtics did an excellent job creating scoring opportunities off of penetration-kick and second chance possessions from offensive rebounds. Congratulations Coaches Shawn Fuller, Jenny Fraser & Isabelle Fournier-Smith and the Celtics club! Valley Heat was impressive all weekend! Their defensive intensity directly fueled the offensive end in the Championship game. 2023 combo guard Grace Walton’s on-ball defense and ability to score on the offensive end weighed in on her Tournament All-Star selection. Congratulations Coaches Jeff Starratt, Brian Veale & Tony Smith on a great season and Provincial Championship!